This one’s a shortie. 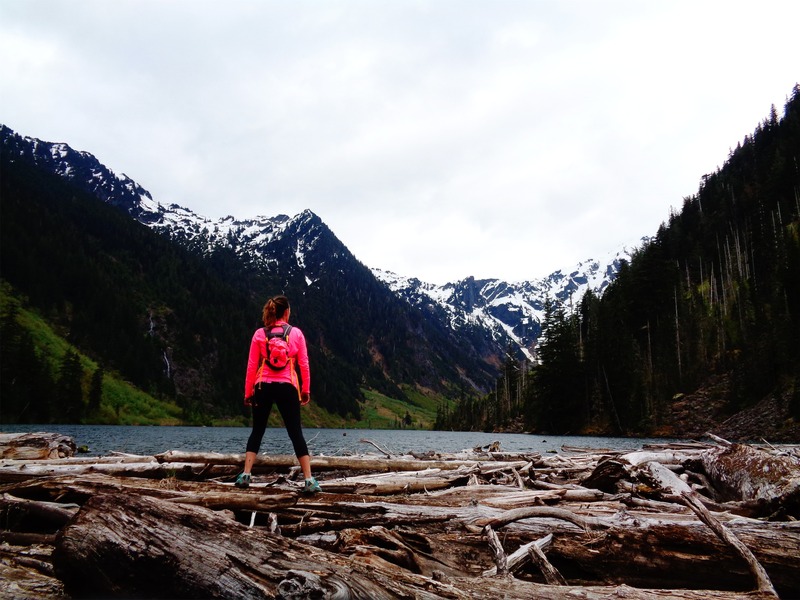 I had the day off, felt like a trail run, and Goat Lake had been on my list since moving here. It’s funny, a lot of the hikes on my original list now pale in comparison to the things I’ve been discovering, but I still feel a need to at least check them out. Whether it’s for an “easy” day, or so I am more capable of answering customers’ questions, or so I can say I did it, it doesn’t matter. 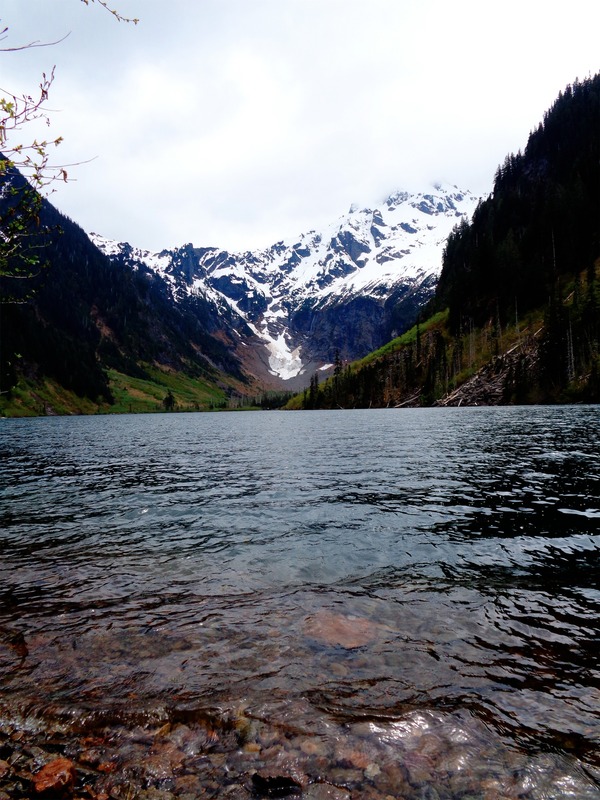 And this was finally the day to go to Goat Lake. 5/12/2015, and just sayin, it didn’t live up to its name: no goats to be found. Upper trail, wide, flat, and green! The road was completely clear, and actually didn’t even have many potholes. I followed a jeep most of the way there, until they pulled off by the Gothic Basin trailhead. 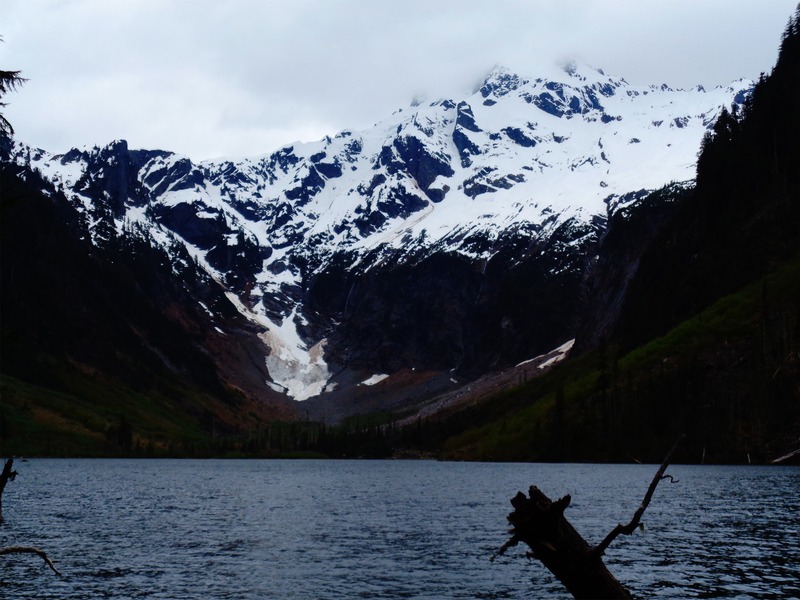 Last time I tried to do Goat Lake, the gravel part of the Mountain Loop Highway had been unpassable in my Honda Accord due to several inches of snow. As much as I miss that car, I’d have made it to Goat Lake easily that morning in what I have now. I pulled up to the trailhead, only car in the lot as usual, and hopped out with my trail running pack. Soon enough, the jeep pulled up – a couple who wasn’t entirely sure where they were going. I remember when I was like that. I’d be lurking along the highway trying to figure out where the hell to go, and now here I am probably capable of drawing a map of the southern half of the loop from scratch. Who’s a dork? Okay, now that I had the pressure of other people behind me, time to start running. I usually like to walk the first half mile or so (especially after driving for two hours), but it was straight down to business this time. At least until I was solidly ahead of them. So they wouldn’t see me walk/running. Yeah, I know. Back when I had calf issues, I’d plan my sad recovery runs along main roads that had lots of intersecting dead end streets so no one would see me walking if I had to. 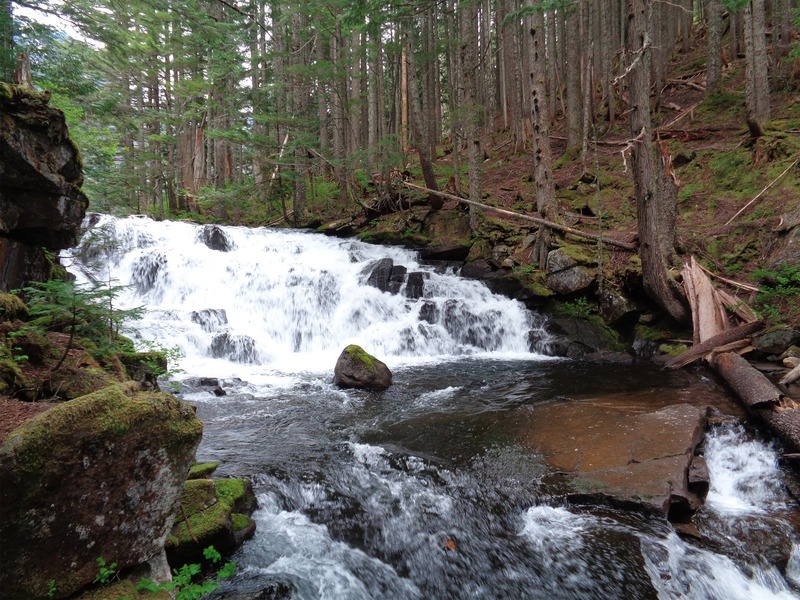 I did stop to look at wildflowers and waterfalls, of which there were plenty. Bleeding hearts! 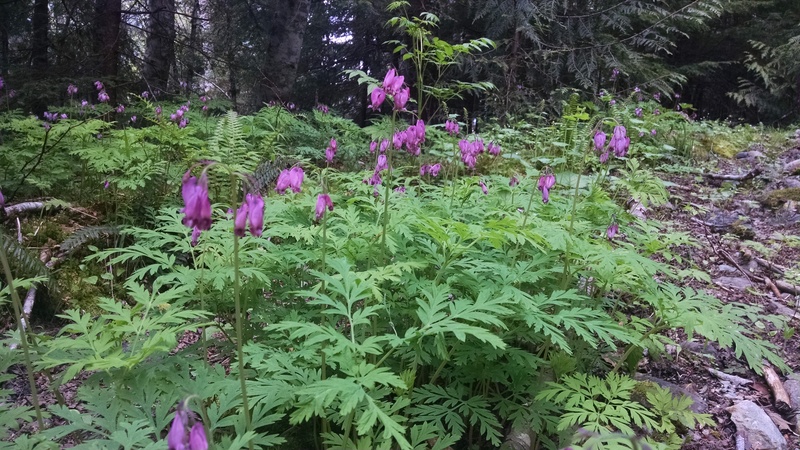 They were one of my favorite flowers as a child, and here I was jogging through patches of purple bleeding hearts covering the ground left and right. I took the upper trail on the way to the lake, figuring I’d take the lower one on the way back. The upper trail is much more gradual and well-groomed. It’s an old road, apparently. Think wide, flat, not too rocky or rooty. Until it rejoins the lower trail. Then it gets a little steeper, and a little more rooted. And of course, spiderwebs here and there for your enjoyment. Not. About a half mile from the lake (slightly longer if you follow all of the switchbacks) you can go off-trail to a huge waterfall. I actually missed where the trail turned (I’m far more oblivious on my trail runs than on hikes) and was staring at the waterfall trying to figure out how to get across when I realized the trail probably just goes up to the lake. You can see on the Strava map where I farted around on the way up by the waterfall (I took the switchbacks on the way down). Getting up to the lake is incredible. The first view you get comes if you sneak through some bushes to the huge log jam, which you can basically hop across right up to the edge of the lake. 10/10 would recommend. You can already see the snowy peaks from there, but I suggest going further along the left side of the lake, where the views are even better. It was mostly cloudy when I was there, but the sun snuck through the clouds for a hot second, and I sprinted to the shore to take a picture. On the way back, I took the lower trail. I passed the couple in the jeep (“Wait, you already got to the lake?! Wait, you’re RUNNING?? Oh man I’ll never be in shape enough to do that!”) just before where the lower trail and upper trail joined. Ugh, the lower trail had spiderwebs. A plethora of spiderwebs. My caloric intake for the day was probably 15% spiderwebs. You’re welcome, hiker couple, I ate all of them before you got there. 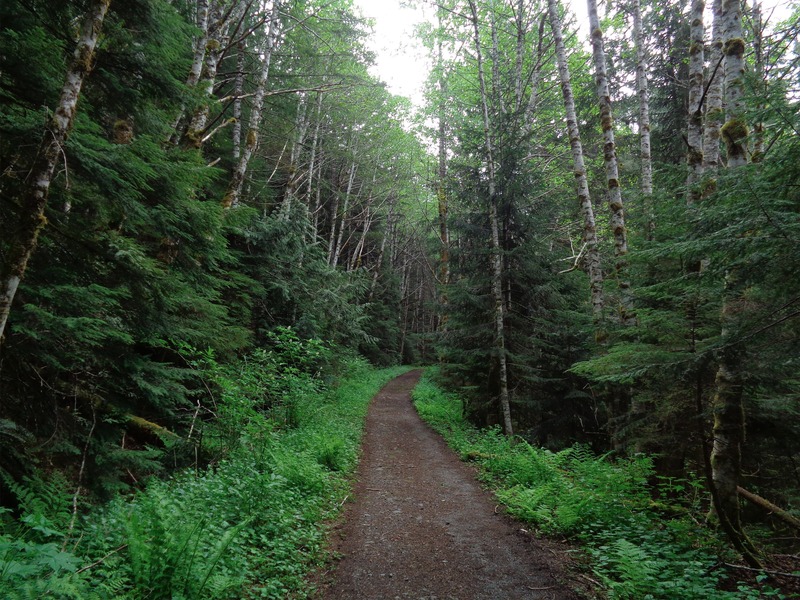 The lower trail is more narrow and windy with much more vegetation, and dips next to the river occasionally. 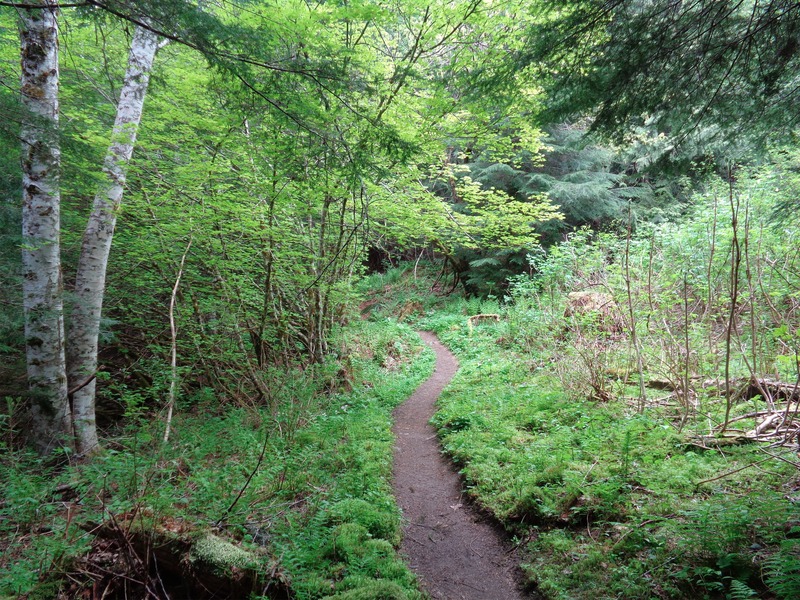 If you like footwork on your runs, take this one instead of the upper trail. It was nice to mix it up, though, and it almost felt like a loop instead of an out-and-back. I was back at the car pretty quickly, and while my splits weren’t amazing, I felt pretty good (maybe the slower pace is why – shh!). I can see why this trail gets so much traffic. The water would have been gorgeously clear and blue in the sun, and even in the clouds and wind, it was still spectacular. Something about the wind whipping across the water made me miss the ocean, and I was glad to have the lake all to myself. If you look real hard at Strava, maybe you can see how many time I ran in circles trying to get 10-second-timer selfies on the logjam. Perhaps you’ll have better luck. 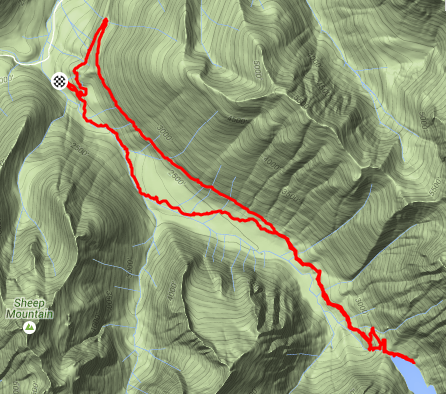 This entry was posted in Cloudy Days, Mountain Loop Highway, Trail Runs. Bookmark the permalink. Love the selfie. Stop effing with my webs.